Last year I found a vintage bee pin at a flea market in Paris, then found another bee pin when I got home. They'd both be right at home with this Gucci bee purse! Photographs by Brenda Coffee. 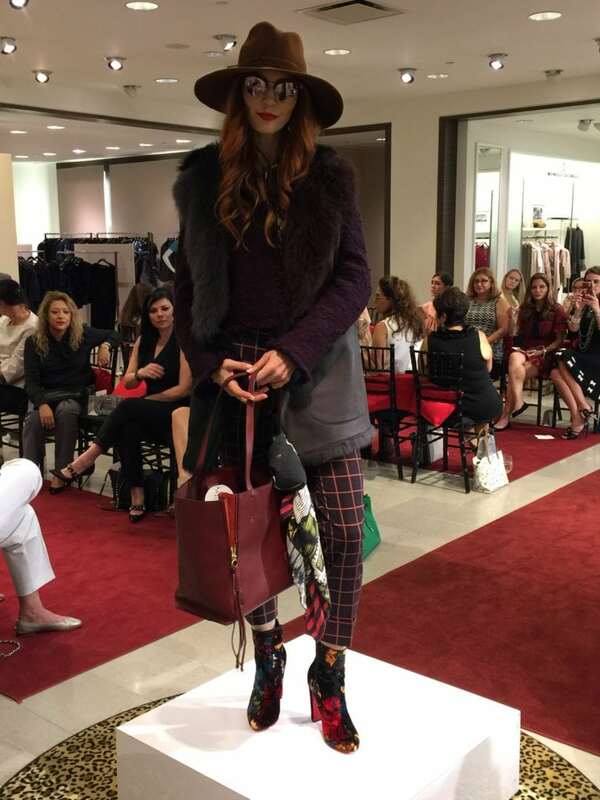 Neiman Marcus La Cantera, in San Antonio, always has the best fall trends fashion shows. This year the trends are “rocker chic,” featuring lots of denim, velvet, great metallics, layered necklaces, plaids, detailed embroidery, hosiery worn with dresses or peeking out of skinny jeans and the color red! Don’t be afraid to mix them all. Put them together, and create your own style! 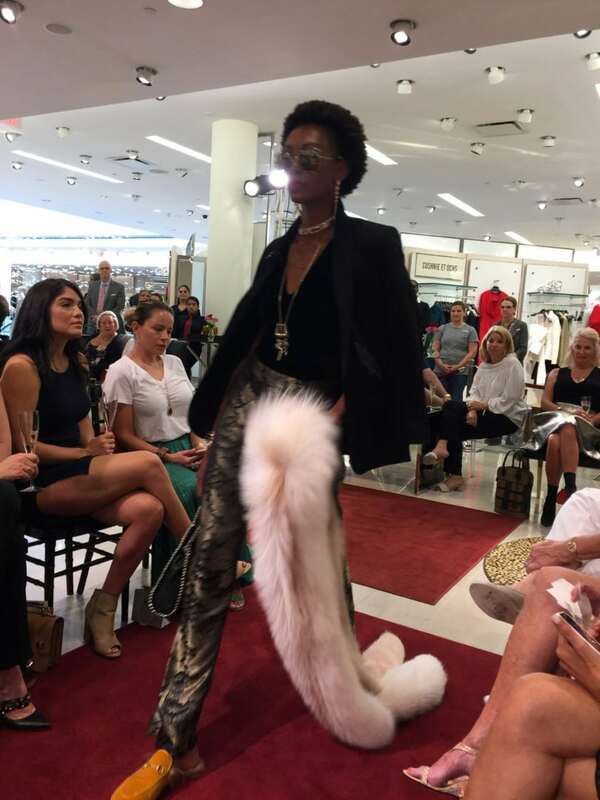 Neiman’s fashion shows are always so well done with champagne and nibbles, gorgeous flowers, cool DJ music and the main attraction which features fabulous clothes, furs and jewelry. 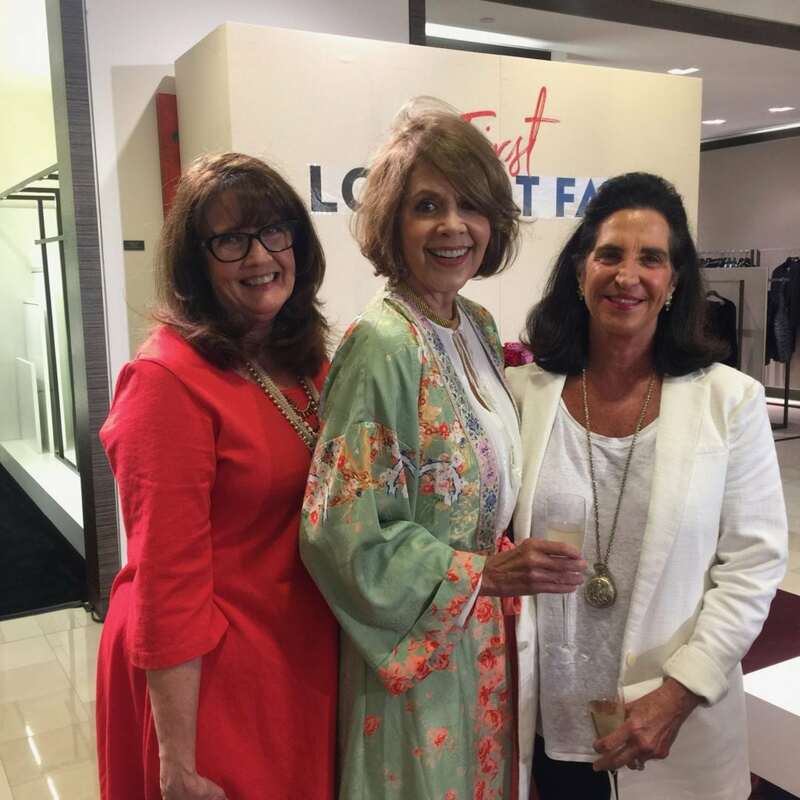 Joining Xitlalt Herrera-Salazar, Public Relations Manager for Neiman Marcus, San Antonio–behind the scenes and as MC–was Couture Manager, Jim Foster. It was the perfect occasion to introduce Allen Barber, the new Vice President and General Manager for Neiman Marcus, San Antonio. This first outfit mixes one of Ken Downing’s–Fashion Director for Neiman Marcus–favorites: a great jacket worn over the shoulders. 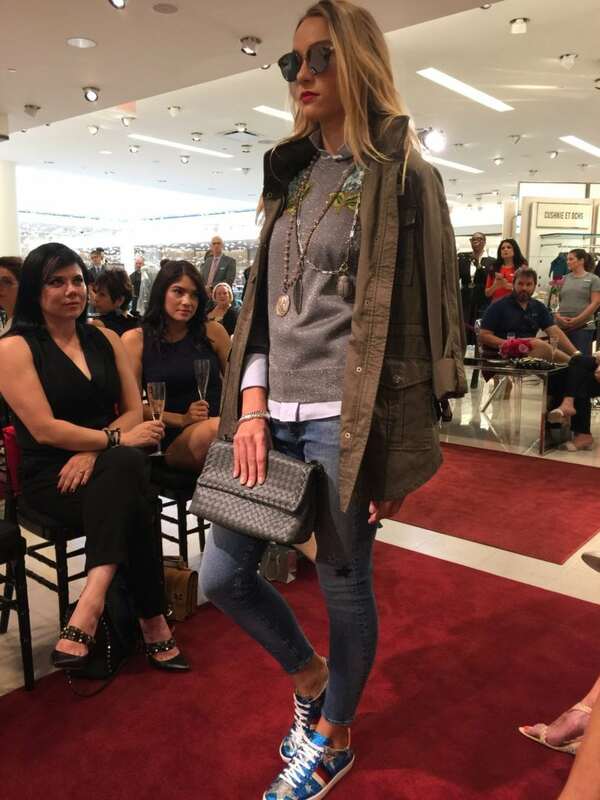 The army jacket, Brunello Cucinelli sweater, layered necklaces, jeans and sneakers, all come together for a fashionable mix of high/low. Furs are big, again, this year. Our mothers used to wear a little fur stole, but a long fur scarf is modern and chic. The blazer worn over the shoulders reminds me of something Lauren Hutton would have worn in a ’70’s issue of Vogue. 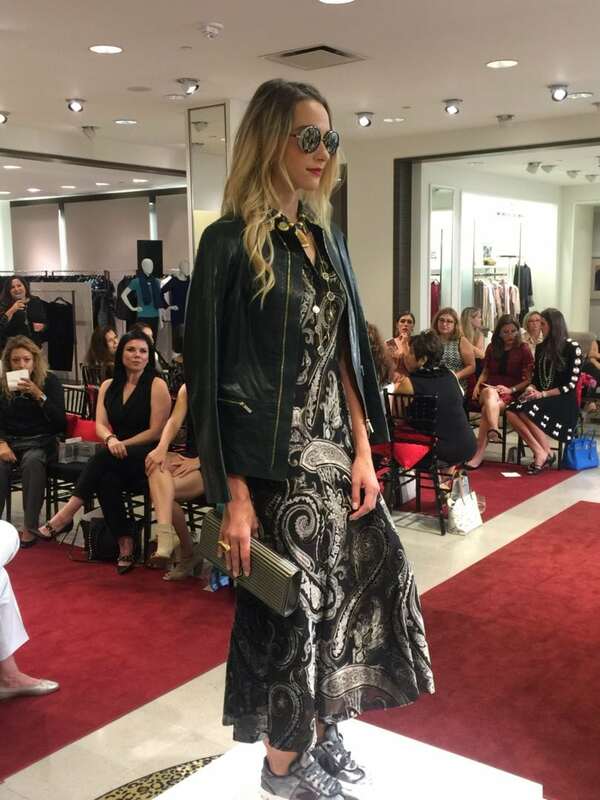 Regardless of your age, even if you’re wearing a long formal dress, style it with a black leather biker jacket or a bomber jacket over your shoulders. Love this Stella McCartney bag, dark opaque hosiery and the bees on these Gucci boots! The color of the season is red with a bold lip! Don’t be afraid to mix shades of red and pink. This Gucci headband has a wonder woman feel to it. You may not be able to tell, but the model’s wearing cream fishnets under her plaid skinny pants. A very ’70’s, rocker chic look. The pants are from Theory with an Akris Punto blazer, and the toasty brown, felt fedora has a sprinkling of tiny, red, spiky feathers and a delicate chain around the headband. Since the crown height is a tad asymmetrical, it’s a bit Maryann Faithful meets Pharrell Williams. It’s gorgeous! It’s also now in my closet! Hello, Italy! Think about velvet for daytime, not just for evening! Love this tissue paper velvet dress with Chinese gambling coin necklace and another necklace with Buddhas, plus her silver sneakers. BTW, men are also wearing velvet this year, whether it’s velvet loafers or a velvet jacket. 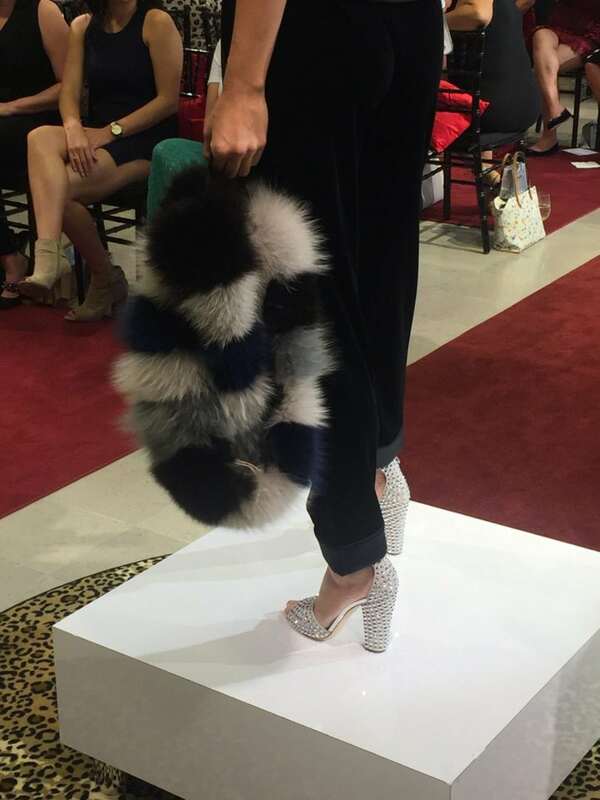 L-O-V-E these swanky, crystal studded shoes and fur wrap. 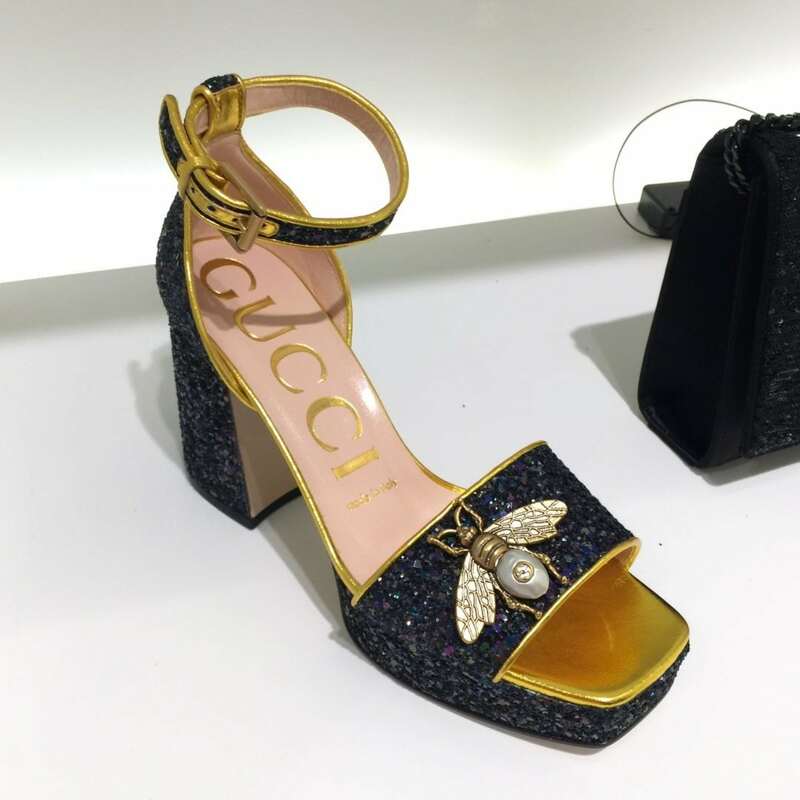 More Gucci bees!! Look at the details on the body and the wings, the metallic flecks on the shoes and the gold trim! 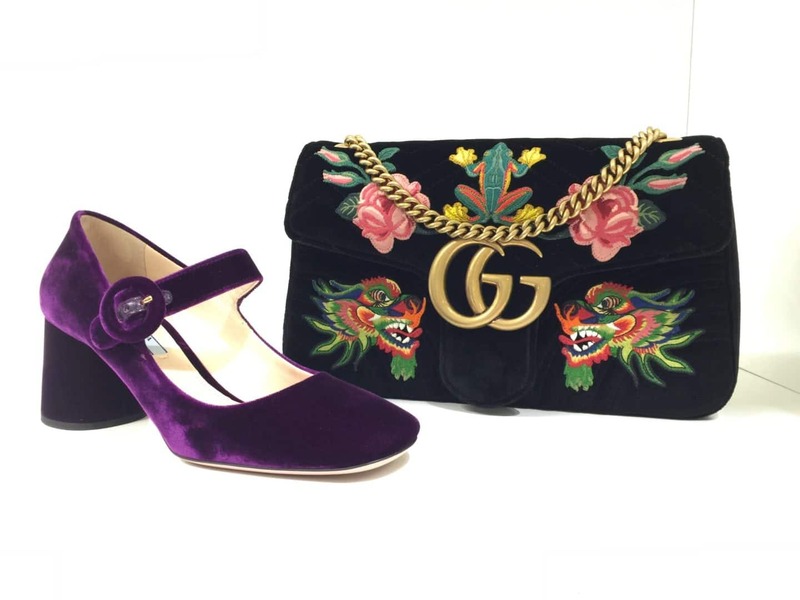 Velvet shoes and a beautifully embroidered purse, both from Gucci! So which of these pieces can you add to something you already have in your closet? Remember this is the season of embellishment and mixing! Don’t be afraid to wear what speaks to you. None of your friends wear things like this? Give them permission by wearing it first. 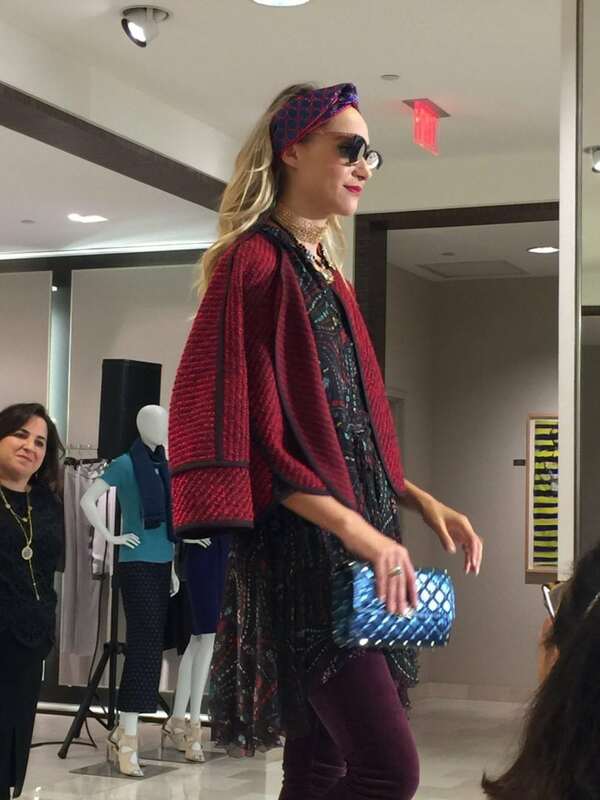 BTW, I was the only woman at Neiman’s Fall Trends fashion show, wearing a kimono, and I didn’t care, even if no one told me my hair was windblown! If there’s one thing I’ve learned this summer it’s that Hildie Plumpepper is the woman most of us wish we had the guts to be or had the money to “bee!” Go for it, girlfriends! What are you waiting for? Loved this!! 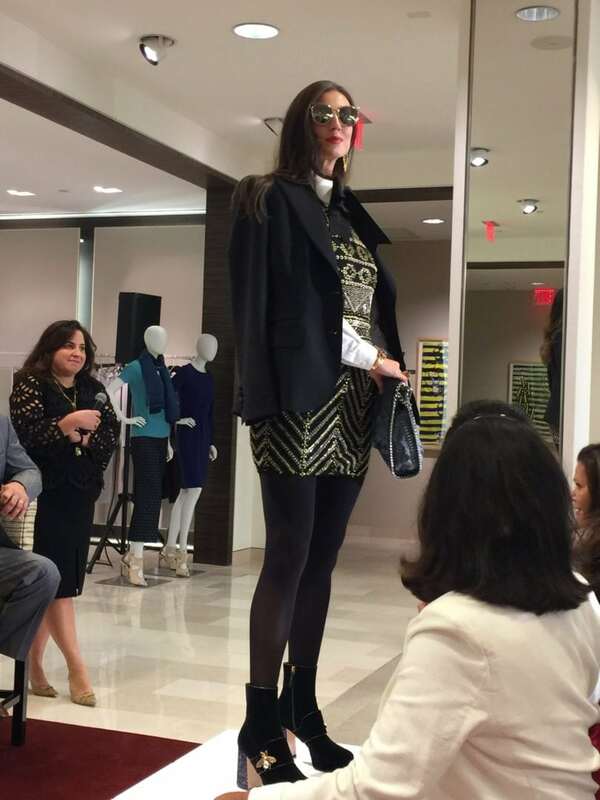 !And I agree with you, here in Miami Neiman always host great events! Happy weekend! Happy weekend to you, Chuky! I got so many fun ideas and enjoyed watching the show with you Brenda! You are going to look awesome at that Stones concert! Brenda, I adored all the photos, especially that first look! Your kimono is so fab and you look gorgeous in it! I agree with you…I wish I had the guts to be as bold as Hildie Plumpepper, although I’m slowly getting there! I think I’m closely related to Hildie !! !